May 2016 accounting graduate Graham Spencer-Orrell has always been known as a super fan of Belmont’s sports teams, but after last week’s women’s basketball game against U.T. 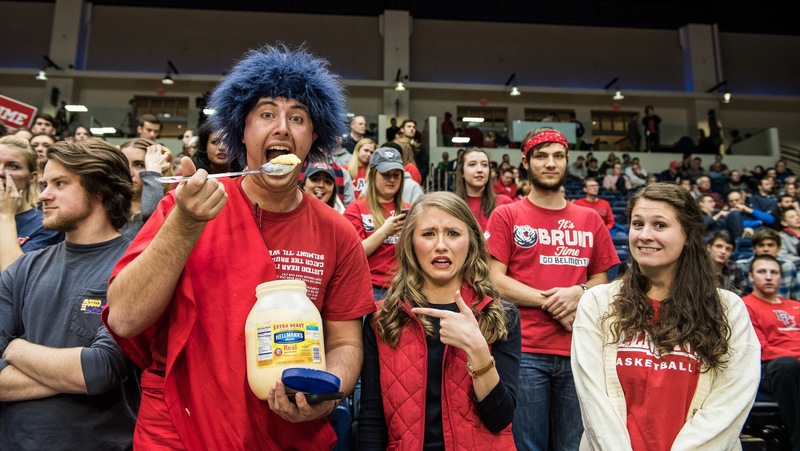 Martin, you may just recognize him as the “mayonnaise eater.” The 2015 recipient of the David Fish Award for fan loyalty received media attention from several major sports networks after ESPNU cameras caught him eating giant spoonfuls of mayonnaise straight out of the jar in the stands behind the broadcasters at the January 5 game. By the next day, Spencer-Orrell’s few innocent seconds of fame had over 1.12 million views on Instagram and had been shared by Sports Illustrated, ESPN’s SportsCenter, USA Today Sports and The Washington Post. Spencer-Orrell says that the jar of mayonnaise started out as a joke when he brought it to a game a while back. However, since that game, it has turned into a superstition as he claims that Belmont has never lost a game he’s carried it to. Sure enough, with the unconventional help that his mayonnaise jar provided, the women’s basketball team resided over U.T. Martin with a score of 71-66. Although he enjoyed his moments in the spotlight, Spencer-Orrell said one of his favorite parts of this experience was the extra exposure it brought to the women’s basketball game. To view the video shared by SportsCenter, click here.